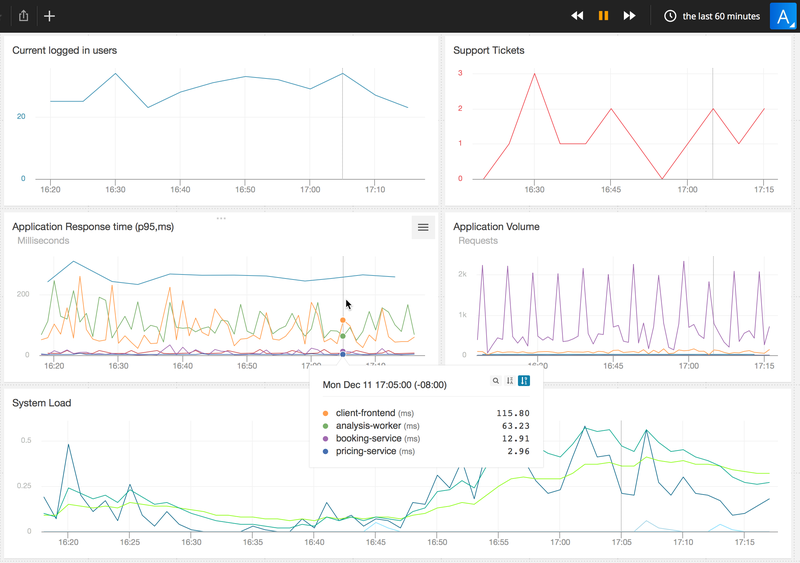 Dashboards were designed to easily create and display elegant arrangements of related data. 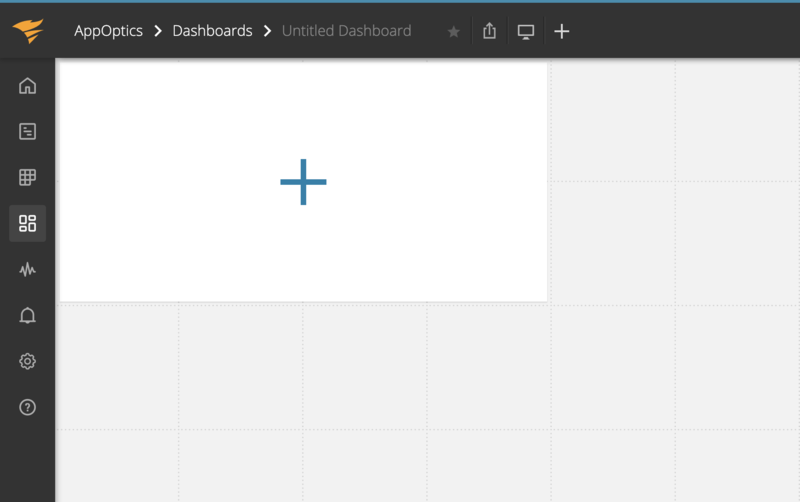 Dashboards are grid-based so you can place and resize individual charts by dragging them around and adjusting their resize-corners. If you resize the browser window, your charts will resize themselves to preserve their relative sizes and locations. The Dashboards page lists all the available dashboards and highlights the recently used and favorite ones. You can favorite dashboards by clicking on the star next to the name in the list. When the dashboard is open there’s a star right next to the name in the menu bar as well. Clicking on “Create a New Dashboards” creates a blank slate with a placeholder for a chart begging you to click on the big plus sign. With dashboards, building and editing charts is really fast. Without leaving the work space, you can easily create and modify charts in-line. This includes manipulating metrics, annotations, chart axis labels, titles, and more. If you select “Edit Chart” from a chart menu, or add a new chart to your dashboard by clicking on a [+] symbol, we’ll slide-up the chart editor where you can add or remove streams, and change the stream composition. To dismiss the chart editor, click on the blue up-arrow icon in the top left hand corner of the window. We hope you’ll agree that the new chart-editor is a joy to work with. Quickly filter your available metrics by entering a few keywords, and then check them to add them to the chart. You can also click the orange “Composite Metric Editor” button to create a new metric by performing mathematical transformations on any of the metrics you’re sending us. Once you’ve added some metrics to the chart, you can use the metric stream check box to select all of them, and set attributes like the display summarization, tag filters, and grouping functions for all metrics at the same time. You can also make tags dynamic, so that they appear in the menu of the dashboard. The attributes menu – accessed via the hamburger menu icon to the right of each metric – allows you to set per-metric attributes like custom colors, a separate y-axis, and unit labels. Mousing-over any chart in the workspace brings up a tool-tip legend and a cursor-tracking line on the chart. The line is mirrored in every chart on the workspace so you can easily correlate data across charts, regardless of relative differences in chart size. The tool-tip legend provides rich context no matter how many hundreds of streams the chart might depict. You can sort the legend by the highest or lowest value, or alphabetically by name in ascending or descending order. Clicking the magnifying glass in the legend allows you to filter the streams. All charts auto-refresh with an interval based on the shortest associated metric period. If no periods are set, it should refresh on a 30 second interval. If you want to look at historic data you can either use the date picker or, for more recent events you can step back and forward in time with the << and >> buttons in the menu bar. Clicking on the back button will pause the auto-refresh and move the time window back half the display period. Clicking on play will bring your dashboard back to real-time and switch auto-refresh back on again. The Dashboard Profile icon in the Dashboard menu allows you to save profiles and switch the dashboard between a light and a dark theme. Whichever theme you prefer you can save it as your default. You can configure chart sizes, positions and theme and save it as a separate profile, allowing you to quickly switch back and forth between saved profiles. 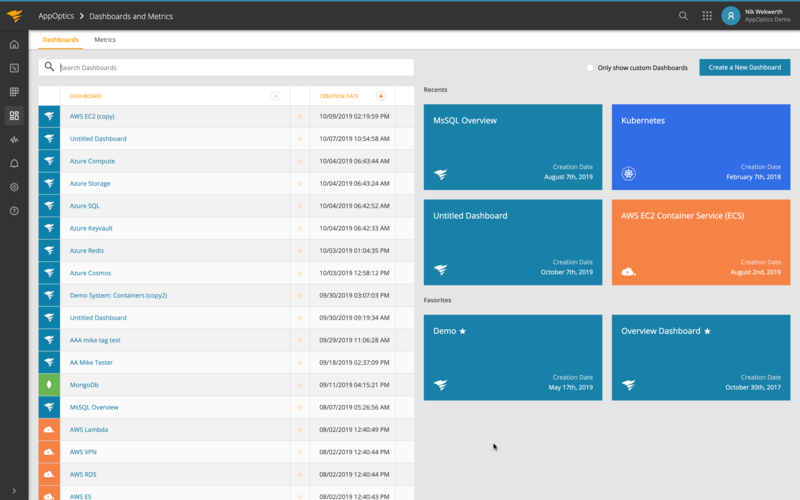 This will allow you to configure the same dashboard e.g. for different screen sizes. If you want to tweak an existing dashboard or modify a curated dashboard (like Heroku or AWS), you can copy dashboards using the share button in the menu bar. 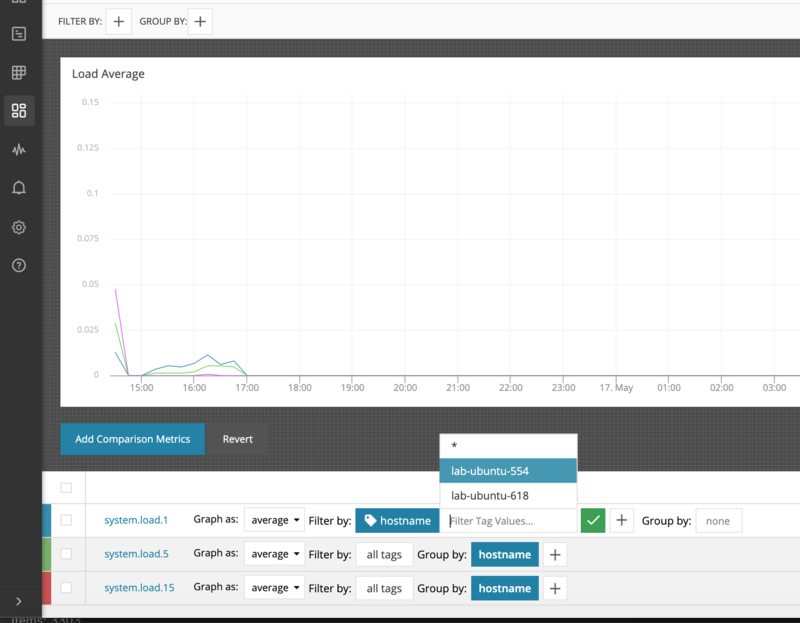 Give the copied dashboard a name, and you’re good to go. On the dashboards index page, you will find “Copy Dashboard” in the drop down menu, both on the dashboard rows and Recents/Favorites cards. You may optionally check the “Open dashboard on completion” box to conveniently navigate to the copied dashboard after it has been generated. The copied dashboard contains all of your charts and streams organized the same way as the original dashboard. It is important to note that charts within the copied dashboard are copies: updating charts or chart layout in the copied dashboard will not affect charts or chart layout of the original dashboard. 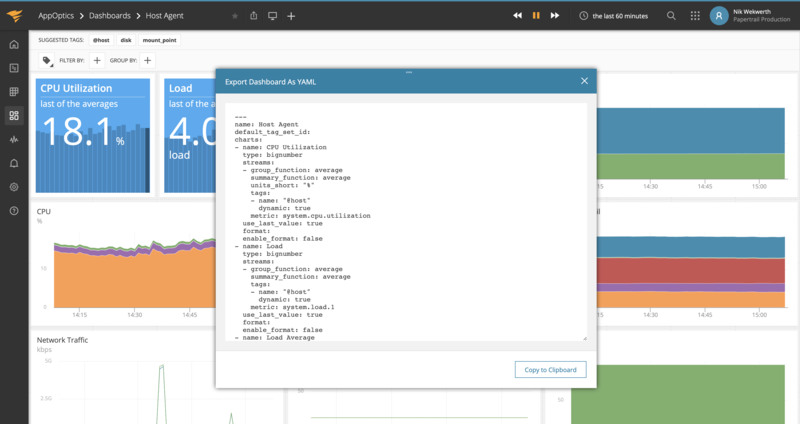 With the dashboard export feature you can create a YAML file that describes the dashboard setup and configuration in code. This is useful in case you would like to create a backup of your dashboard configuration or if you want to share it with someone who has another AppOptics account. Selecting “Export” opens up a modal that contains the configuration of your dashboard in YAML format which you can copy to your clipboard. Inversely, selecting “Import” allows you to import a YAML file to recreate a dashboard. Paste the configuration (the content of the YAML file) into the modal that opens up and click on “Validate”. You are about to import a dashboard. All charts will be deleted and recreated according to the import. Any deleted charts cannot be recovered. After clicking OK, the dashboard is created. 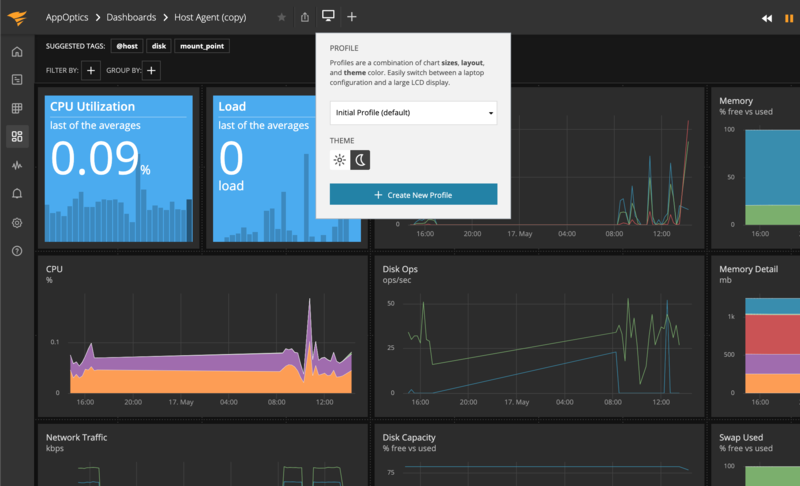 If you want to share dashboards with customers, friends or colleagues that don’t necessarily need access to your entire AppOptics account, you can use the share feature. This feature allows you to create and manage multiple private links for each and every dashboard in your account. On any dashboard you want to share, just click on the share icon in the menu bar and select the Share Dashboard option. If you have already shared this dashboard and just want to see the link or manage shared links you can select the Share History option. Shared dashboard links will always share the default profile of your dashboard (see Dark Theme and Profiles). Clicking on the Share Dashboard option brings up a modal window that asks you to name the link. This is useful to keep track of what you used the link for. Another very useful feature is that you can select to lock the dynamic tags to a specific tag set. If you don’t lock a dynamic tag then the shared dashboard will present an aggregate of all streams associated with the metric. Clicking on Generate Link generates a private, read-only link to a dashboard that locks in that tag definition. The link opens the dashboard in read-only mode without any need to log into your AppOptics account. 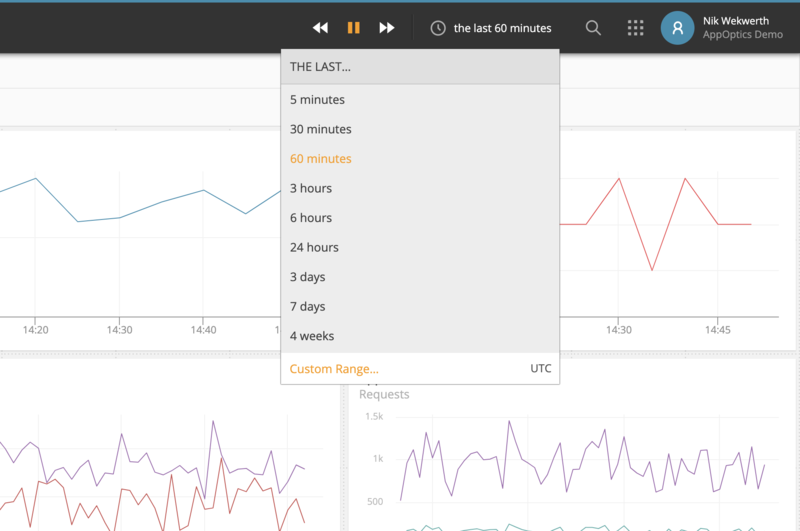 Read-only dashboards live-update and allow the user to change the time frame using the date-picker. Users will not be able to add/remove/reorder the charts on the dashboard. Selecting the Share History option takes you to a list of all the links that have ever been created for the dashboard. Aside from allowing you to safely share curated visualizations more broadly this feature is also really useful if you want to load a dashboard on public wall-mounted displays without having to log in to an account.